If you’ve seen the recent Nigella’s cooking series ‘Simply Nigella’, you will recognise this recipe. I liked it partly due to the back story and for the ingredients. 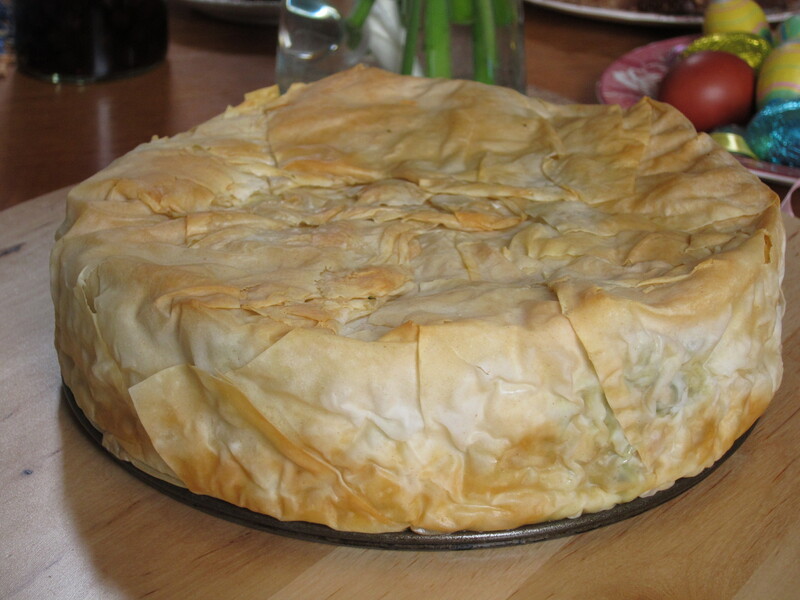 She called it Old Rag Pie, but that’s the English interpretation for the Greek Patsavouropita, created by the bakery as a way of using up old scraps of filo pastry. Hence, the “old rags” indicated by the title. Another reason why I absolutely adore this pie, is that it pretty much pleases everyone. It can be served with plenty of honey on top to satisfy anyone with the sweet tooth, or serve it without and it will be perfect for breakfast, as a snack or even as a starter. Melt the butter in a small saucepan, then take it off the heat. Line a 20cm square cake tin with a layer of filo pastry, making sure it comes up the sides; you will need to use more than one sheet. Then pour 1 tablespoon of melted butter over the pastry. Using one third of the remaining filo sheets, tear and scrunch the sheets up and drop them loosely in the tin. Then crumble in half the feta, sprinkle with just under ½ teaspoon of thyme leaves and pour a third of the remaining melted butter over the top. Repeat, so that you use up all but a little of the butter and a small amount of thyme. For the last layer, you can use larger pieces of filo “rags” (as it’s the lid), filling the tin a little more tightly, but still scrunching them. Fold the edges of overhanging filo over themselves, and pour the remaining butter on top. Using the sharp point of a knife, make 2 cuts down and 2 cuts across into the filo-packed tin, from edge to edge to create 9 sections. It’s important that you don’t use a blunt knife, as you don’t want to drag the filo or press down on it. Beat the eggs with the milk, then pour over the contents of the tin. Sprinkle the last bit of thyme along with the sesame seeds on top. Let it stand for at least 30 minutes in a cool place before baking. If 2 hours is easier for your timetable, then put it in the fridge. And you can do this in advance (see top recipe tips). Heat the oven to 200C/180C Fan, and bake the pie for 30 minutes. When it’s ready, the pastry will be golden-brown and puffed up, and the inside set. Let it stand for 10 minutes, then spoon 1 tablespoon of the honey over the top. Cut into slices or slabs – using a serrated bread knife and sawing action to prevent squishing the filo on top too much, then pushing the knife down to cut through. If you decided to serve it as a desert, pour the desired amount of honey on top of the pie directly in the tin. Alternatively, serve the pie as is with the honey on the table for people to add it if they wish. Here is another one of my adaptations of a Nigel Slater recipe, from his book Eat. In this recipe, his is more like a carrot soup with toppings, which is lovely, but by making it a few times I decided to convert this recipe into the main dish. The original recipe calls for boiled carrots, but I opted for sweet potatoes instead and to roast them first to intensify their sweet flavour. Roasted sweet potatoes are pureed and studded with spiced black beans before being crowned with a generous scoop of fried onions. 2. Cut the sweet potato into cubes, place them on baking tray with some olive oil, sprinkle with salt and pepper. Roast for 30 minutes or until it’s done. 3. Meanwhile melt 30g butter in a pan, add 2 teaspoons of mustard seeds and toast for a minute or two. Drain two cans of black beans and add them to the pan, cover and cook for 5 minutes until it’s warmed through. Leave aside. 4. On another pan melt 30g butter, add the sliced onion and fry until golden brown. Scatter in a large pinch of dried chilli flakes and further teaspoon of mustard seeds. Sizzle briefly. Leave aside. 5. Puree or just roughly mash the cooked sweet potatoes, season to your taste. 6. Divide the pureed sweet potatoes between two large bowls or four smaller bowls and stir in black beans, top bowls with fried onions and garnish with Feta cheese and coriander leaves. Beans are one of the staples of Mexican cuisine and they come in dozens of varieties. The simple recipe of cooking them gently with onion and an aromatic herb is, perhaps, the most common method of preparation for any beans. In a large heavy pot, heat oil over medium heat. Add onion, garlic and peppers and cook until tender about 5-8 minutes. Stir in oregano and cumin, toss to coat vegetables. Pour in stock and beans and bring to a boil. Reduce heat to a simmer and cook for 15 minutes or until the beans are tender and cooked. Puree half of the soup in the blender until smooth and stir back into soup pot. Check for seasoning. Serve hot with garnishes. Since I tried this recipe, I can’t stop making it and telling everyone about it. It’s a perfect match of sweet juicy watermelon flesh against the sharp and salty Feta cheese and olives, balanced with mint flavour. It is Summer on a plate for me! 1. Peel the cucumber with a potato peeler, cut in half lengthways and, using a teaspoon, scoop out and discard the seeds. Cut into crescent shapes. 2. 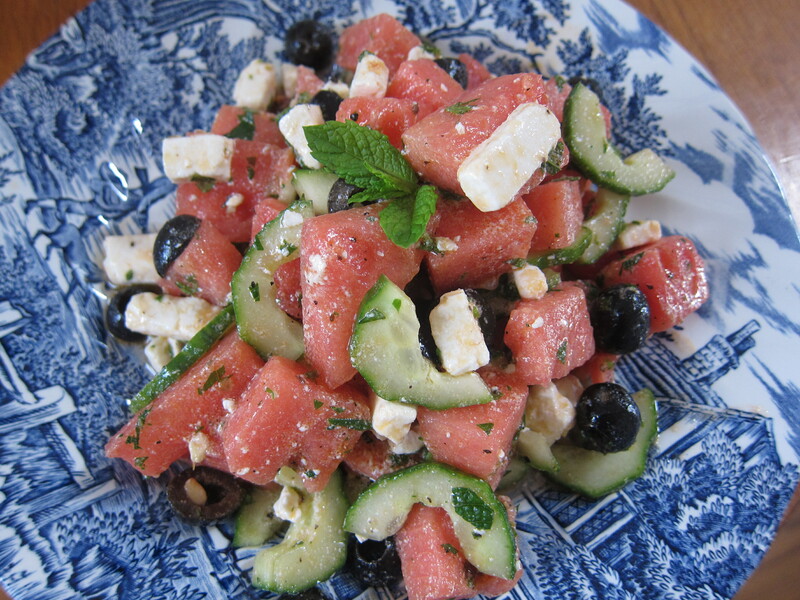 Layer half the watermelon, cucumber, feta and olives in a bowl, repeat again, then sprinkle with the chopped mint. For the dressing, whisk together the oil and lemon juice, season with salt and pepper and pour into the bowl. Serve chilled. 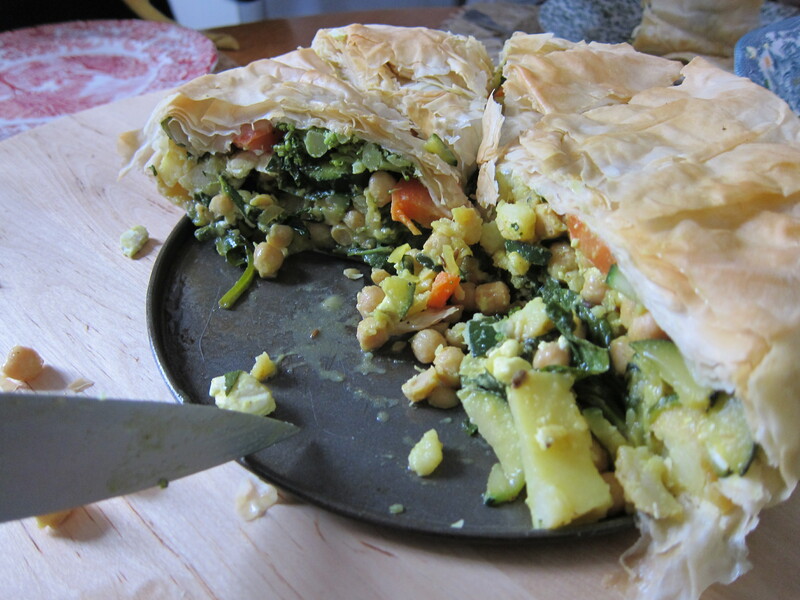 I’ve been making this pie (originally adopted from Nigela’s Domestic Goddess book) a lot recently and I’ve tried all sort of fillings, using rice, cous cous, lentil along with different vegy selection, but this version still remains my favourite. 2. In a large frying pan gently fry the cumin seeds and onion in the olive oil until the onion is soft. Add the rest of the spices, courgette and cook on a fairly high heat to prevent the courgettes becoming watery. When they are soft but still holding their shape, add the spinach and quickly cook until it just starts to wilt. Tip it over in a big bowl, let it to cool slightly. 3. 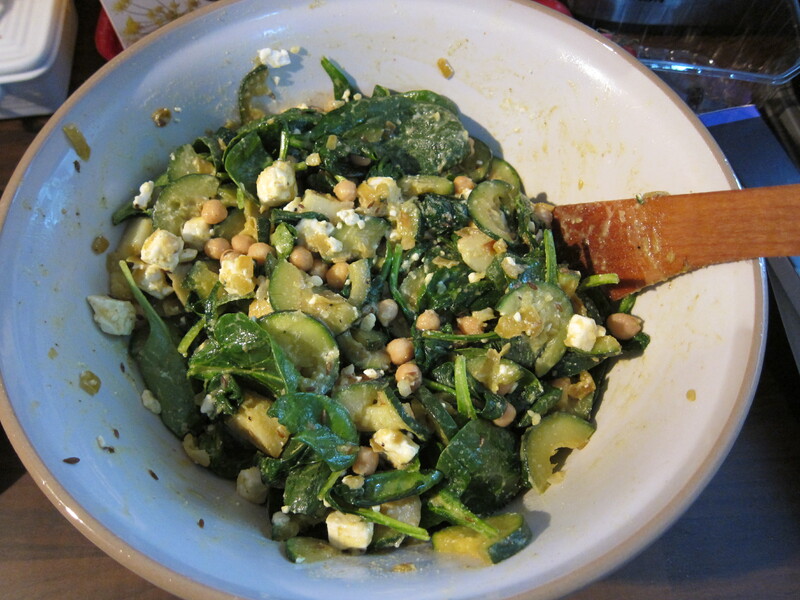 Add cut potatoes, can of drained chick peas and cubed feta cheese, mix everything to combine and check seasoning. 4. Brush the inside of the springform tin with some melted butter. Line the bottom and sides of the tin with 3/4 of the filo pastry, buttering each sheet as you layer. Leave a little filo overlapping the sides, and keep 3-4 layers for the top. Carefully put in your filling and then fold in the overlaps. Cover with the final coat of butter and put in the oven for about 20 minutes or until the filo is golden.